Victoria Barnes posted the MOST amazing Craigslist find this morning, and it helped me make my final decision…I’m posting all my contenders! It’s the only way to be remotely worthy of linking to her post. Plus, I realized, my three things are a past project, a current project, and a future project! You get to see some progression, all in one post! First, there was the dining room chandelier. When we bought the house, it had a two-arm Greek Revival lamp that had been converted from gas. It was okay, but it bothered me that it was so small for our seats-twelve dining room. But with a thousand other projects to contend with, I resigned myself to living with it. 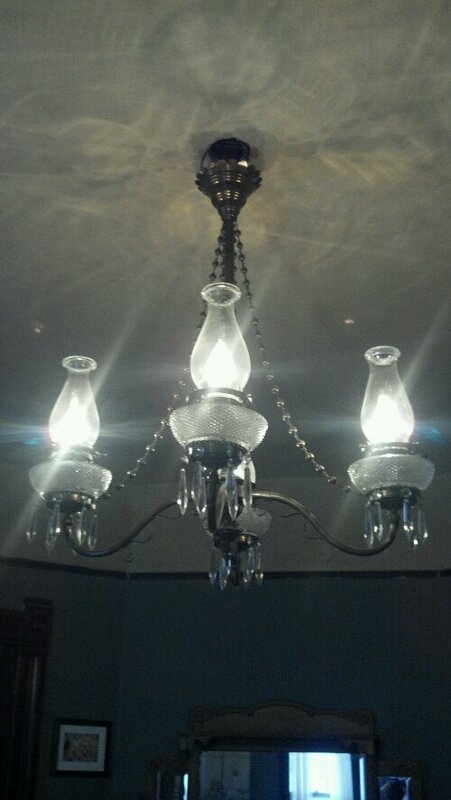 BUT THEN…one of my neighbor posted a photo to facebook of a chandelier that he had just rewired. It had cut glass kerosene reservoirs, crystals, brass beads, it was just SO LOVELY!! So perfectly Victorian and delicious, I had to have it. It wasn’t where I should have been spending money, but I didn’t care (and I did get the neighborly discount..rationalize, rationalize, rationalize!) It makes me happy every time I walk by it. And that Greek Revival light? It moved one block north, to the house that’s been lovingly named “The Greek Lady,” even though it’s really Colonial…they meant well, and “Colonial Lady” sounds more like a company that makes muffin mixes. 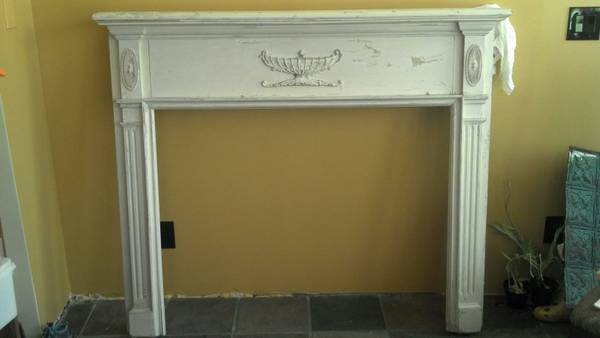 My next favorite is a fireplace mantle that I just found. I’ve discovered that I don’t really do things the way I should in this house, y’know, with a plan. I work my way through inexpensive projects, while trying to work out financing for the big projects (don’t even get me started on Neighborhood Finance Corp…it’ll work out someday). The next thing I was willing to spend Money on was a fireplace mantle for the dining room. Our original was urban mined before our time here, and it felt like the house was wounded and bleeding. It needed a mantle band aid, STAT. I’d been looking, but everything fabulous was $3000, and everything else was too big, not big enough, and generally $1000+. Sigh. Then, in the last booth at the Des Moines Home and Garden Show, was the Habitat for Humanity ReStore Store booth with a lovely Colonial Fireplace. It wasn’t Mr. Right, but it had Mr. Right Now potential. Plus, it was a steal, so I bought it and brought it home. As soon as I got it here, it bothered me. Putting a Colonial band-aid over a Victorian wound didn’t seem right. Of all the rooms I wanted to screw up, the dining room was not the one. I could go into details about the lovely woman that haunts this room, and how I want her to be happy, but let’s just leave it that, one day, it’s going to be my masterpiece. So, back to Craigslist I went, and this time, instead of just looking in Des Moines, I searched Iowa City, Omaha, and Kansas City. There it was, my precious. The perfect size, with mirrors, and just right level of decoration. It needed to be finished, but it was already stripped. Jackpot! 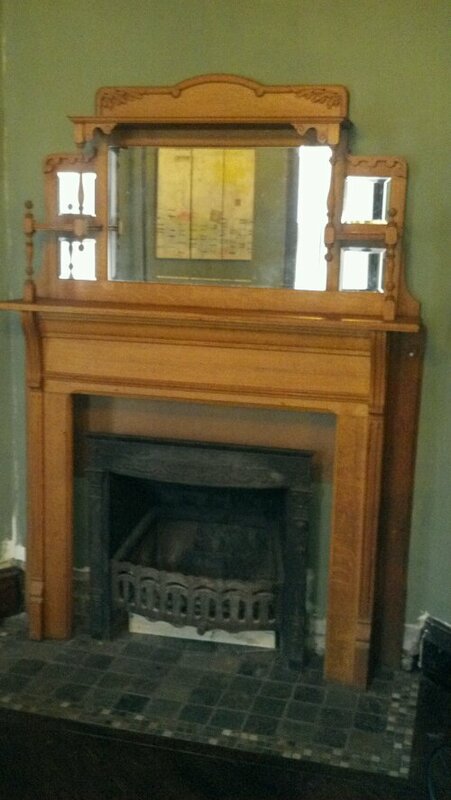 I emailed back and forth with the owner, negotiated the firebox, which made my heart race, into the original price. I went and bought it, as well as some tin ceiling she had, which will show up in future projects, and brought it home. It looks so lovely. My master plan for the dining room is slowly coming together! Rubs hands with evil laugh! Oh, and you can take the Colonial one off my hands here! Finally, a preview of my future favorite. This find is from Urban Finds, at the 2 Crazy Redheads booth. (Ignore the Easter eggs in the photo, we’re still Jewish, but the next door neighbors invited the kids to partake in their hunt.) I’d never been to the once a month junktastic Urban Finds, but I think I’m about to be a regular. First of all, 2CR is run by a woman I’m Facebook friends with, but have never met, so we created a little scene upon figuring out that we’d finally managed to meet each other in real life. 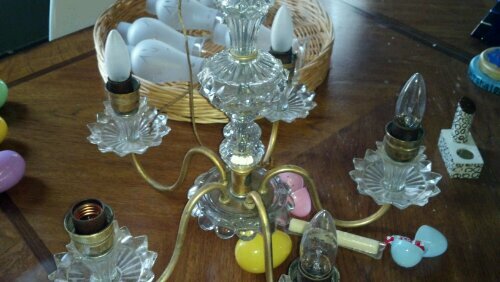 Then, I found this chandelier, which I think will be perfect for my kitchen, for $60. Best part? It needed to be rewired! I’ve been on an adventure of learning how to rewire fixtures, which makes me totally excited, learning a new skill! It’s the best part of this house…learning all these lost art skills. I can’t wait to get it finished and walk you all through the process! Stay tuned, for the next episode of #FavoriteThings! P.S. I’d love to see links to your favorites in the comments!